AdAction leads the mobile app industry with performance-based marketing solutions and data-driven technology, optimizing campaigns to drive quality installs and downstream engagement. Our premier, full-service ad platform delivers over 8 million monthly installs for elite agencies and Fortune 100 companies across 180+ countries. To the Happy Hour above the rest! 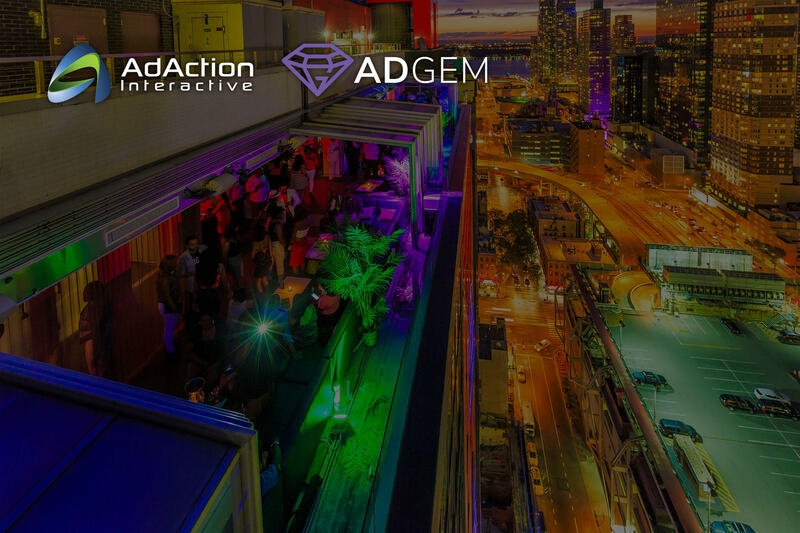 Join AdAction and AdGem 34 stories above Times Square during this year's Affiliate Summit East. Enjoy complimentary custom cocktails and savory bites with the industry's leading experts on Monday, July 30, 2018 from 5 to 7pm. ...like never before. Escape from the sweltering city streets and cool off at one of the highest rooftop lounges in the city. Where you can challenge your fellow ASE colleagues to a friendly competition of Giant Jenga or Connect 4, listen to the DJ spin your favorite tracks, and look out over Midtown with a Manhattan in hand. AdAction leads the mobile app industry with custom, performance-based marketing solutions and data-driven technology, optimizing acquisition campaigns to drive quality installs and downstream engagement for maximum ROI. AdAction is the premier, full-service ad platform that delivers over 8 million monthly installs for elite agencies and Fortune 100 companies, leveraging exclusive partnerships with top publishers to reach target users in more than 180 countries worldwide. AdGem is the premier, reward-based monetization SDK and marketplace, focused on connecting advertisers to engaged audiences worldwide with a user-centric approach. Through advanced bidding technology and robust targeting, AdGem provides a high-quality native ad experience to users, maximizing ROI for developers and marketers alike.